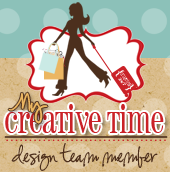 Hi two all my wonderful "My Creative Time" friends..We are on day three of the MCT 12 days of Christmas Blog hop. I'm so glad you are here. You have no idea how much I appreciate all of your wonderful comments. Ok, on to the hop...If you came from Liz's blog, you are in the right place. Up next is Nikki's blog. Here is the line up in case you get lost along the way. For my project, I made a cute little charm bracelet using Emma's stamps and Polly Shrink plastic sheets! This was the first time I've played with Polly Shrink plastic...My kids thought it was the coolest thing ever! It was very simple to use. I just followed the directions..with the exception of using my heat gun instead of the oven. I colored the images before I shrunk them using Bic makers. Lets just say I had a happy camper..I'm going to make another one for my 13 year old daughter using black beads and MCT Keepin' it Classy Stamps. How cool would that be! Anyways, hope you enjoyed my project today. Don't forget to hop along! Very cute and it looks like someone really loves this special bracelet! What a neat idea! Awesome job!! Super cute!! Looks like your daughter loves her new bracelet!! Fantastic job!! Ooh have not used shrinky dinks will have to give them a try this is super cute! This is a great idea! Your daught is a cutie, too! What a great idea and what little girl wouldn't want one of these!! This turned out so CUTE!!! I can see your daughter just loves it! If I can find the plastic...I will be making one of these. Thanks for reminding me as I keep forgetting this project. Great job! I bought the sheets but have not been brave enough to try it lol. I will soon! I love these and make these sometimes. What a great idea to involve the kids. So cute and what a darling little one who is "modeling" your design. What an adorable gift idea! Fantastic job!! cute great idea for a gift. Nancy, cool bracelet. Nice job! I would of never thought to use a stamp set to make and incorporate into a bracelet. wow! what an awesome idea!! love it and I will try it too! thanks for sharing this! What a cute idea! Love the bracelet. So so so adorable. I love it. Look at that little smile on the little one - she loves it too. I love playing w/ Shrinky dinks. They are so fun. The project is amazing but the model is so lovely. God bless her! Thanks for the idea. I love your bracelet. Thank you for sharing. what a lovely gift for your daughter! AW that came out so cute and the little one looks like she loves it. I am yet to try that Shrinky Dink with my stamps. I used to play with that as a child. It's so nice to know, it is still around. Cute bracelet and great idea! such a cute gift for a little grandchild. Beautiful. This is such a cute idea. Your little one looks so super proud of her bracelet. That charm bracelet is just darling! My niece would love something like this.. Thanks so much for sharing! I look forward to seeing what you'll be making in the days to come. Love the bracelets. That's the looks of you did great mom if I ever had to say so. Great project. What an amazing idea! Your daughter is sweet. Oh, now how cute is that??!! My daughter would LOVE for me to make her a bracelet!! Adorable!!! I love your idea of using the "Keeping it Classy" set! I guess I will be out shopping for shrinky - dink material! Thanks for sharing such a great idea! How cute! Your daughter looks very proud of her bracelet. Thanks for sharing. Soooo cute!! I HAVE to try this stuff!! Thanks for sharing!! What a cute bracelet. This is a cool idea for gift giving. Your daughter is adorable. Nancy, that's the cutest thing ever! What a cool idea! Well, isn't this the cutest bracelet ever. What a super idea. Didn't know you could use your heat gun. Thanks for sharing that fun tidbit. This is such a darling, darling bracelet!! I love it. sooo cute!! love this idea!! Your bracelet is too cute!! This is so cute. You are very talented. Soo super adorable!! I know a few people myself that would like these. What a fabulous idea! I love how your bracelet turned out and you have encouraged me to give this a try! lol The ideas are just endless! This is a very cool idea. Thank you for sharing! So cute and fun!!! My daughter's would love something like this! Super cute. I have been wanting to try out those shrinky dinks! My granddaughters would love a bracelet made with them! Love, love the bracelet idea. How clever! This is a sweet little bracelet. Great job. Looks like such fun -- I've got to give it a try. Thanks for giving me this idea as my DGD aged 8 will LOVWE it! Cute bracelet. She is so happy! Cute idea, I love the bracelet!! LOVE THIS IDEA...think I'm going to lift it for a class party for my kindergartener's class chistmas gift! this is so cool! never thought of this!! lol it turned out great! what a great project. I love the bracelet you created. YAY to the Christmas music "Jingle Bell Rock"
Omg, what a super cute charm bracelet!! Thanks for the chance to win. Cute bracelet. I haven't iused shrinky dink but I may some day. That turned out great. soo cute! WOW, that is amazing! I love it. What a cute bracelet! I love this idea! Adorable bracelet!! I love all the charms! So cute and your little model is adorable! My granddaughter loves the shrink plastic too! Now why did I think of that?! Wonderful bracelet I think this is adorable and great idea! That is one fabulous bracelet! It certainly looks like she loves it, TFS! This is so cute!!!! You did such a wonderful job! Very cute and so is the bracelet!!! My grand daughter would like it. Nice job. Oh my, how cute is that!! Great idea to make bracelets with shrink plastic.